calle crisologo | let's go pinas!! Vigan is one of the most convenient places for local and foreign travellers to explore as the touristy places are just within short walking distance from one another. One can just meander and forget time, just foraging for antique reproductions and touristy trinkets at Calle Crisologo. But one can also find the other gems at Vigan’s old avenues – this time, the savory kind – streetfood. Have you had the taste of sinanglaoan? 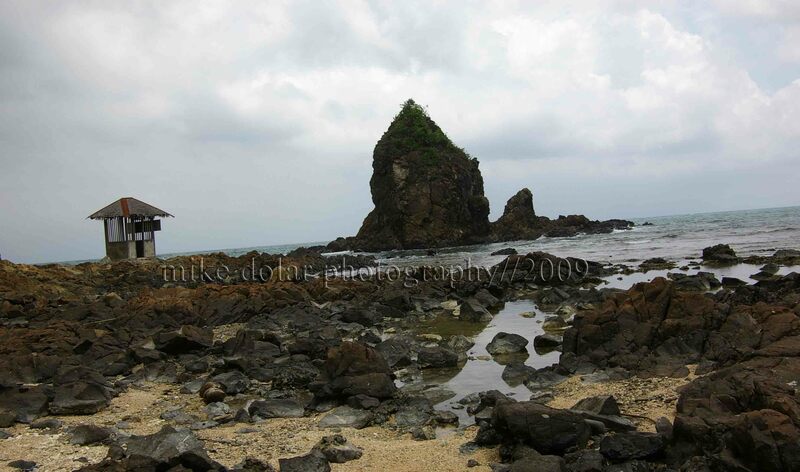 It is a staple fare within Vigan and most possibly in other towns of Ilocos Sur. 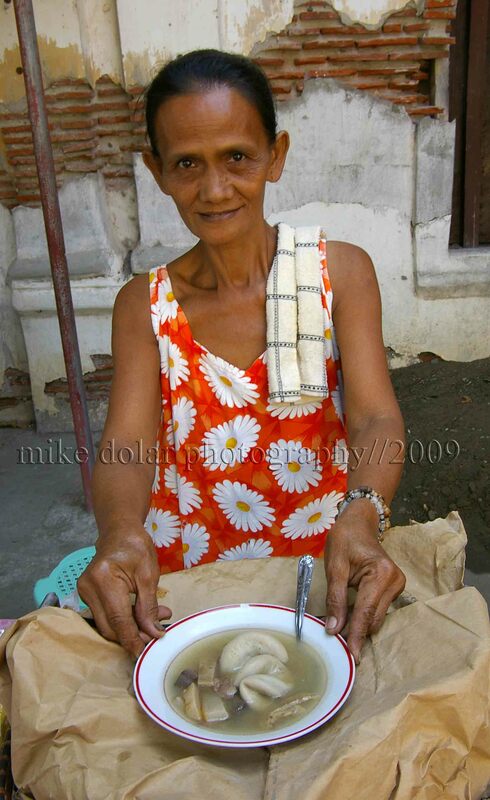 And at one of the refined streets of the Mestizo District where the post office is, Aling Antonia prepares a bowlful of brothy snack which gives out this blended taste of bitter and sour. Sinanglaoan looks very intimidating. Innards and other cow parts – intestines, liver, skin float around in a stew. And that is how straightforward the dish is – just the clear stock and its main ingredients for one to consume. The meat parts though are simmered slowly in rice-washed water, providing tender and easy to digest meatcuts. The dish is evocative of a highly popular appetizer amongst the Filipino liquor drinkers – the papaitan. The sharp vinegary flavor of sinanglaoan proceeds to a subtle acrid aftertaste. Interestingly enough, flavorsome as the sinanglaoan is, condiments are still formulated to make this Ilocano dish even more tasty. How about choosing between Iloko vinegar or (surprise-surprise) papaitan sauce to enhance this P40 per bowl dish. To those whose say that sinanglaoan is an acquired taste, then gulp some cold cola to wash down the bitter taste. But for those who relish it, then there is already some good reason once the uric acid results shoot up. For those having less daring tastebuds, then it is just some walk towards Plaza Burgos where they can find stalls and kiosks whipping up more familiar goodies like okoy and empanada. Everyone can have such tasty treats and while away the time, just looking at the ladies create these concoctions or just do some people watching at the plaza. Both empanada and okoy are deep fried merienda meals that are highly popular even to tourists. Okoy is cooked from a batter of egg, flour, and some small shrimps including the shell, creating an impressive crunch in each bite. Empanada on the other hand has cabbage, and vigan longganisa bundled meticulously in a hand prepared soft shell. And if one wants it special, then raw egg is included. After frying, the crispy empanada is now ready for the taking. Just put in some vinegar. In many Philippine kitchens, empanadas and okoy are not exactly fancy cooking but Vigan has definitely made its own impactful brand of street cuisine through these special food items which are affordably priced at P30 each. In one of the sari-sari stores, again facing Plaza Burgos, a guy sells tinubong which is packaged in bamboo sticks loaded with glutinous rice and coconut slivers. Just scoop out the goodness of the sticky rice from the bamboo with a clean finger, if you must. It is a hundred pesos per pack of four. Bagnet (deep fried porkmeat) and longganisa are other recognizable food delicacies from Ilocos Sur but these are not exactly streetfare. And there is nothing like immersing one’s self and passing time through lazy promenades and just munching away these streetfood at the fabled cobbled streets of Vigan. The whole experience can be hypnotic. Just saunter through the streets. And peer without rush at your left and at your right. There are mansions and domiciles, antiquated from an epoch of supposed gracious living. Original Bahay na Bato structures eloquently suggest the era of tasteful everyday life during the Spanish Colonial era. The large arching gates implore you to imagine the masters of the house entering inside, utilizing their horse driven carriage. The upper floor’s capiz shell window shutters, swung open, capture an imagined young lass staring through them at a waiting and hopeful bachelor at the dusty cobblestone street corner. Then there were kids who just played around and finally decided to sit at the floor with their legs hanging from the ventanillas (small windows below the main windows) that functioned originally as an aid to make the whole sala (living space) more airy and well ventilated. 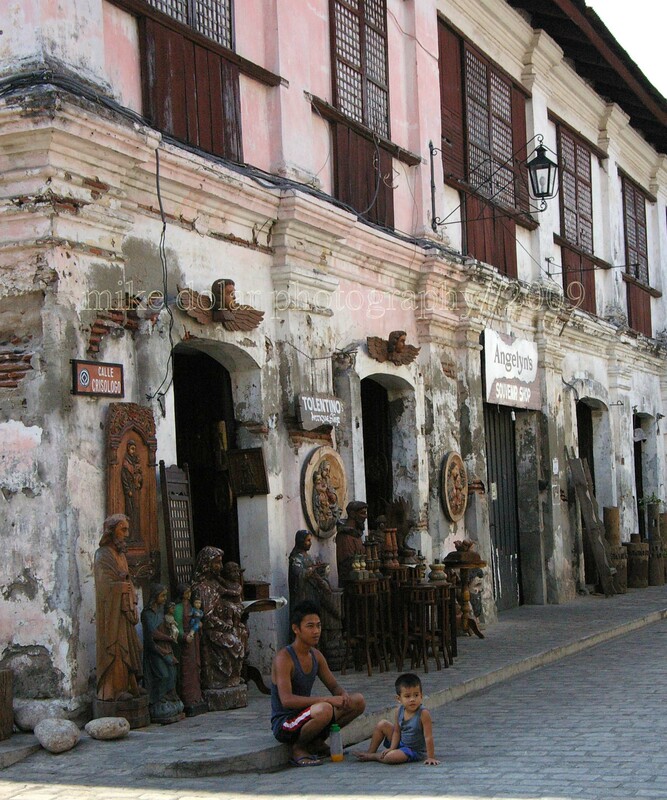 But of course what you get are the remnants of the time gone by at Vigan’s Mestizo locality, more particularly at the restored and much resurrected Calle Crisologo, just a short distance from the main plaza of Vigan. The homes have now weather beaten window shades and aging wooden doors. Wall plasters crumble, exposing the original brick and lime method of constructing the edifice. The patina of grime and disintegrating paint from the structures only make the whole scenario overwhelmingly raw and emotional as the whole place seems to be part of the collective cultural memory of the Filipinos. Calle Crisologo and its parallel streets are part of what was once an enclave for the Chinese migrant families during the 19th Century. Many of whom were entrepreneurs who added relevantly to the economic life of Vigan and built illustrious names for themselves. But through the years, the remaining descendants needed to get out from their ancestral homes, leaving them to caretakers for the maintenance and upkeep. Thus it is not hard to imagine that many of the residences would need so much repair and reconstruction in the later years. And according to the National Museum, a Spain based organization was able to provide seed money for the refurbishing of the whole district during the 90s. And of course the local government had to spearhead the project and inject vigor to the preservation of a definite Vigan heritage. Everything had been spruced up but the buildings need to conform with the architecture and design reminiscent of that period. Clutter that took away from the lure and gentility of the early times had to be lessened significantly. Now, there is much life along the stretch of Calle Crisologo and its side streets. The clip-clop sound of the horses which pull the karitela (carriage) contribute in essaying the recollection. The roaring sound of the tricycles and some window type airconditioning though are the some anachronisms to the place’s full design. The zaguans (where carriages were placed) of yore are now being rented out to stores that display and sell antique reproductions and mementos, enhancing even more its romanticism . 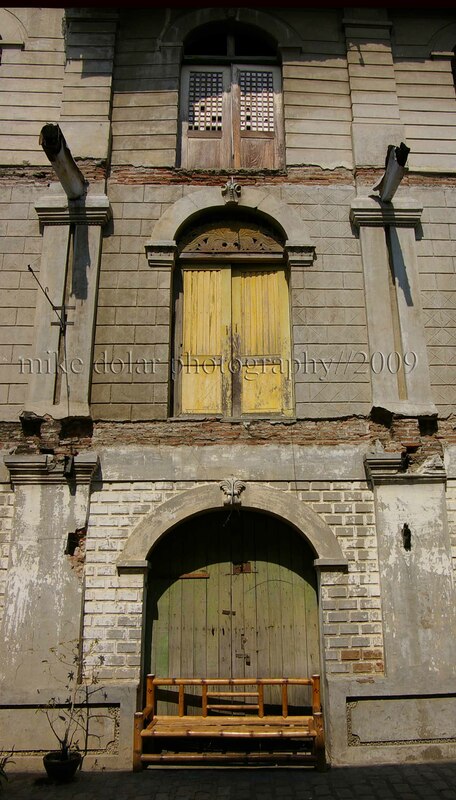 Some of these quarters have now been transformed into hotels and inns which successfully continue the memory and legacy of the old magical existence of Vigan.